If you have been following my blog for a while, you may remember that in the summer of 2011, I found my marriage falling apart. We were separated, broken and didn’t know what to do. Two months later, we’d reconciled and began the process of being better than ever. In those months during and after, I looked for any and every piece of information I could find on restoring a broken marriage and came across a resource from RefineUs Ministries. RefineUs Ministries is the work of Justin and Trish Davis who use their story in hopes of saving other marriages. I found their story so inspiring and followed them on all the social channels I could to keep up with their great information and resources. I was so excited when Justin and Trisha announced that they had a book in the works. I was even more excited when they announced they were looking for blogger reviews and the most excited when I was one of the bloggers chosen. “Beyond Ordinary: When a Good Marriage Just Isn’t Good Enough” is their memoir that brings us along the journey of their marriage. 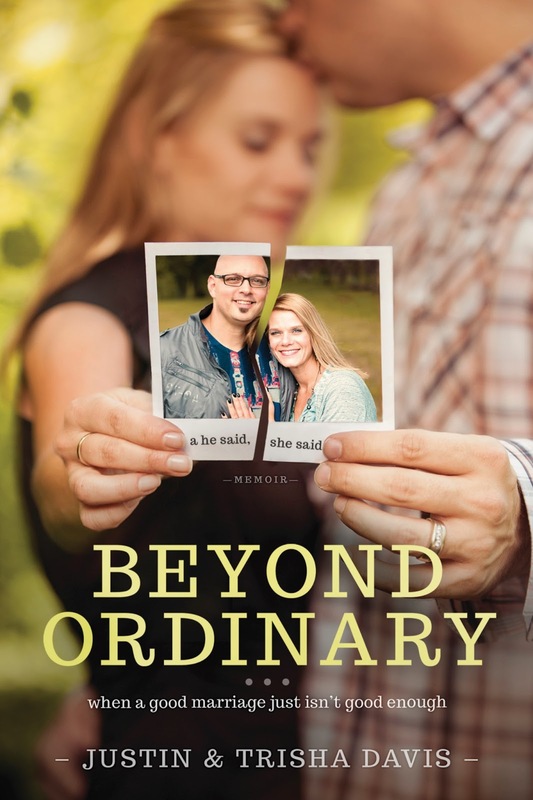 Written in a he-said, she-said format, Justin and Trisha details how their marriage began, how it became ordinary like most marriages, how it almost fell apart because it was ordinary, and how they are transforming it to be extraordinary as God has planned for all marriages. The format is very appropriate and relatable allowing us to see each side of the story and allowing them to be very transparent with their individual point of views. It’s 12 chapters covering different aspects of their journey with discussion questions at the end of each. I LOVED reading this book!! I could relate to many aspects of their journey and the chapters on forgiveness and healing spoke loudly to me. I am so encouraged on our journey of overcoming and transforming our marriage to what God intended it to be. I will definitely be rereading several parts of it. This is a great book for anyone in the marriage stages, be it engaged, newlywed, or many anniversaries in. Thanks to Tyndale you can read the 1st chapter here for free. “Beyond Ordinary: When a Good Marriage Just Isn’t Good Enough” is available on the Tyndale website as well as other major book stores and websites. Disclosure: As a member of the Tyndale Blogging Network, I was given a copy of this book without charge for the purpose of review. All opinions are solely mine.